Microsoft announce an updated SAM MCP exam: 70-713 Software Asset Management (SAM) – Core. See the announcement here: http://bit.ly/2njGGAN and find the full exam info page here: http://bit.ly/2njMRVj. If you want to know when we’re running courses to help you to prepare for and pass this exam then email info@licensingschool.co.uk. Discounted MCP exam vouchers and free re-takes are available and include the 74-678 exam (http://bit.ly/1CoqiQ0). Team these with our self-study guide to give yourself the best chance of passing: (http://bit.ly/74-678-US-Kindle). The Microsoft SAM and Volume Licensing partner competencies are updated to include the new Exam 74-678: Designing and Providing Microsoft Volume Licensing Solutions to Large Organizations, with a reminder that the 671/672 exams won’t be available after January 2015. There’s also a new optional exam for the SAM competency – Exam 74-674: Delivering Business Value Planning Services – one of my all time favourite courses to teach! Get the full October 2014 MPN Disclosure Guide here: http://bit.ly/1s94d1X. September 2014 sees Microsoft introduce a new Volume Licensing exam for the first time in over 5 years. Exam 74-678 is aimed at licensing professionals who sell licensing solutions to large organisations, and replaces exam 70-672. The sister exam (70-671 – for SMB organisations) doesn’t look like it’s being refreshed at this point. The official exam page is here: http://bit.ly/1vWByya but what can you expect from this brand new exam? As before, you need knowledge in four key areas so let’s take a look at those. The first area is the products and their licensing which, we’re told, will account for between 30 and 35% of the questions in the exam. One of the discussion points in the past was actually what versions of the products you needed to know about. Here we see quite a comprehensive list of products with their specific versions. Hurrah! It seems bang up to date including, for example, Windows 8.1, and has all the products you’d expect (Windows Server and System Center 2012 R2, SQL Server 2014, Lync, Exchange and SharePoint 2013, Office 2013) – except perhaps Dynamics CRM 2013 which is tagged on the end of the list. There’s also a much higher emphasis on the Online Services products and you’re going to have to know about Office 365, Intune, CRM Online, as well as Microsoft Azure. There’s also a list of the documentation you need to know about – the PUR and the Product List for example. Then there’s a section on the licensing programs – again 30 to 35% of questions – where you’ll need to recommend the right licensing program for a customer based on some criteria which are given. Select Plus and EAs are listed, as is the new Microsoft Products and Services Agreement (MPSA). Interesting! It doesn’t specifically call out the Server and Cloud Enrolment but given that the wording before the lists throughout is “include but not limited to” I think we can assume it’s in, given its importance to Microsoft. As usual, you’re also going to need to know the specific benefits of Volume Licensing over OEM or FPP licences. Next up is a section on Software Assurance benefits where we can expect 15 to 20% of questions to be focussed. There are some benefits called out – Licence Mobility for example – but again, I think you should assume that you need a knowledge of what each benefit is, and how it meets customer needs, as you did before. Finally, a section that’s always included the things that I personally find least interesting like licence activation, and SA benefit activation, and you can expect 10 to 15% of questions to cover these areas. Our website will soon go live with the resources that we’re producing to help you study for, and pass, this exam. Exciting times! 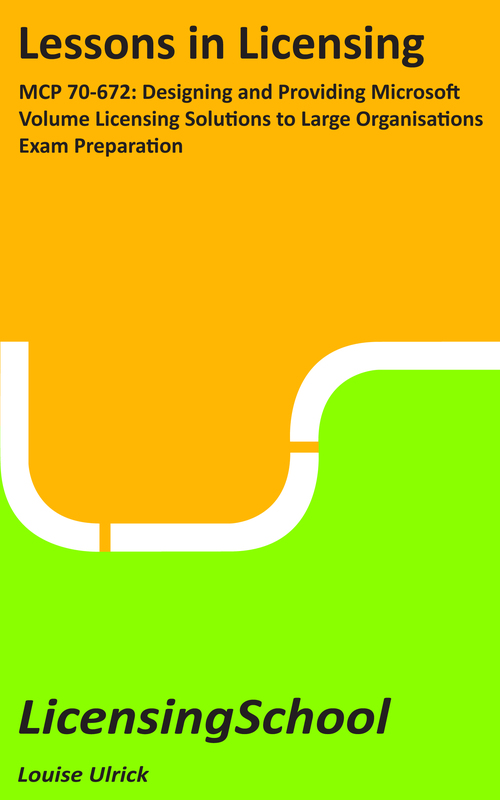 Our MCP Exam Prep Guides are now available in both print and Kindle versions on Amazon. If you need to pass your 70-671 (http://amzn.to/1rOnDeI) or 70-672 (http://amzn.to/1nT2EWt) exams then these books may be just what you need. Microsoft confirm that the MCP 70-671 and 70-672 Volume Licensing exams are finally scheduled to retire on 31 January 2015. It will be interesting to see what replaces them. Watch this space! Full details of all retired exams here: http://bit.ly/1oNOP9v. Microsoft offer two exams in Microsoft licensing at Microsoft Certified Professional level: the obliquely named 70-671 and 70-672 exams. They’re primarily aimed at Microsoft partners who sell the software, but actually look good on the CV or résumé of anyone who works in Microsoft licensing. Both of the exams test you on your knowledge of the Microsoft products and their licensing models, and then the 70-671 exam focuses in on the Microsoft licensing programs aimed at small and medium businesses (Open and Open Value) while the 70-672 exam concentrates on those aimed at large organisations – so Select Plus and Enterprise Agreements. The exams are localised and available all over the world and thousands of people have the certification – both because it’s recognised worldwide as a benchmark in licensing knowledge, but also because it’s required at several levels in the Microsoft Partner Program for partners in the Volume Licensing and SAM Competencies. It’s worth knowing that the exams were launched in 2009 and although they’ve been updated a little since then, you do need to focus on being familiar with the licensing details of slightly older versions of the key products: so Windows 7, Windows Server 2008 R2, SQL Server 2008 R2, and the 2010 versions of the System Center products, for example. We’ve got some nice resources available if you’re studying for these exams. The first is a series of tests which offer sample exam questions, and you should use these to get a feel for the types of questions that are in the exams, as well as to check that your knowledge is complete. These tests are free for you to take as many times as you like as you prepare for your exam and you can find a separate test for each of the key areas of the exams here: www.licensingschool.co.uk/70-671 or www.licensingschool.co.uk/70-672. If you’re currently working on learning the topics required for the exams then I’d recommend some training resources. Over the years I’ve trained lots of people to pass these exams, and it made sense to put everything people need to know in one place. So, I wrote a book for each exam. For each topic there’s an explanation with some nice graphics, some tips on applying your knowledge in the exam, and then some recap questions. At the end of each book there are sample scenarios so you can check you’re thinking the right way for the exams. 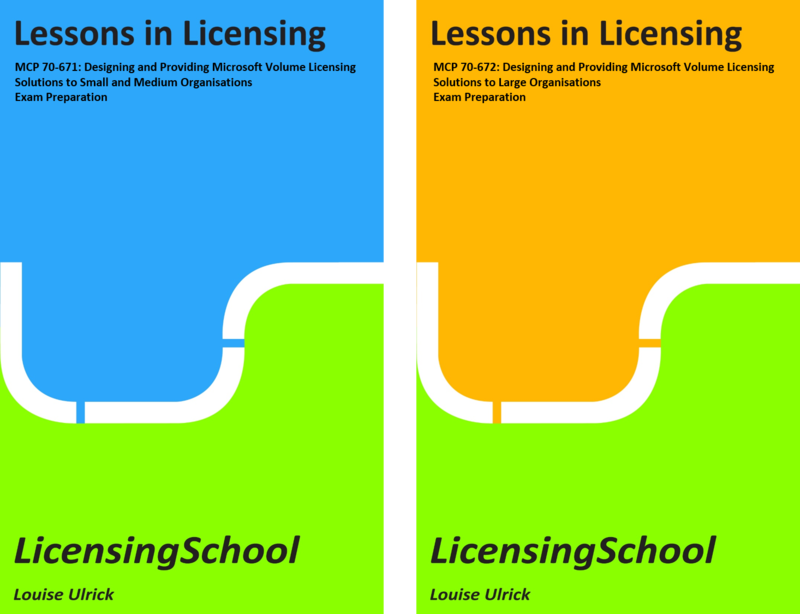 You just need to search for “Lessons in Licensing” on your local Amazon site to find the Kindle versions, or if you prefer hard copies, then you can order those here: www.licensingschool.co.uk/shop. Many people have had success in passing their exams with these resources (check out the lovely Amazon reviews!) and if you’re studying for these exams I wish you the best of luck!